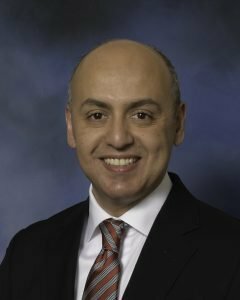 The American Health Council is proud to recognize Dr. Husam Issa, an Infectious Disease Specialist at Clear Lake Specialties, for his expertise in infections and prosthetics (bone & joint). Receiving his MD from the University of Jordan Faculty of Medicine in 1995, Dr. Issa now joins the AHC’s most recognized faces of healthcare and health innovation. With a Temple Residency from Scranton (2002), as well as a Fellowship from Brown University (2005), Dr. Issa brings to Clear Lake, a private practice in Webster, Texas, 22 years of experience within the healthcare industry, including eight years in his current position. According to Dr. Issa, he became involved in his profession after developing an affection for the field(s) of internal medicine and infectious disease, and attributes his success to hard work and his family’s endless support. At Clear Lake Specialties, Dr. Issa engages daily in managing antibiotic usage, consulting with physicians, working with office patients referred from the PCP, as well as caring for patients. Among his multitude of accomplishments, Dr. Issa is proud to have served as a Chair of Infection Control from 2011-2014, as well as an Assistant Professor of Medicine at Brown University. A recipient of numerous awards and honors, including a Fellowship from the Infectious Diseases Society of America and an Excellence in Teaching Award, Dr. Issa has also been awarded recognition for his achievements as Chief Medical Resident, and stands as Chairman of Infection Control Committees in regional hospitals. Dr. Issa is also professionally associated with the Infectious Diseases Society of America, and has been awarded with a Golden Stethoscope Award for Achievements as Chief Medical Resident. In regional hospitals, Dr. Issa is also Chairman of Antibiotic Stewardship. Dr. Issa’s professional goals within the next five years include continuing to contribute to the field of Infectious Disease. In his free time, Dr. Issa enjoys camping, swimming, and exercising his fluency in both Arabic and English. Dr. Issa is honored with a Fellowship from the Infectious Diseases Society of America and an Excellence in Teaching Award. He has been a recipient of the Golden Stethoscope Award for Achievements as Chief Medical Resident.